TIMBERLAND PRO. 92671 BRN. BOONDOCK WATERPROOF COMPOSITE TOE. 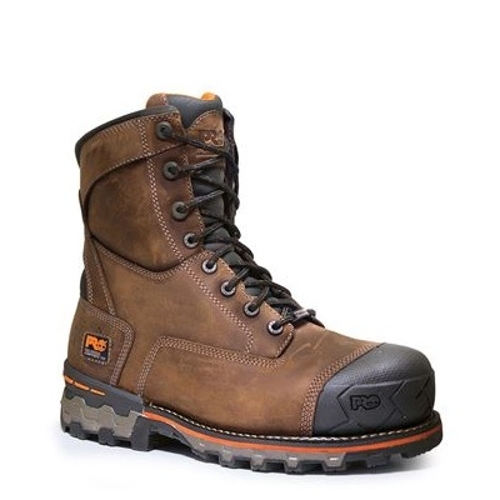 BROWN.These Timberland Pro Men s 8 Boondock Waterproof Composite Toe Work Boots are for men who appreciate a pair of boots that provide rugged performance safety and comfort. Made of premium waterproof leather and lined with a waterproof membrane these boots will keep your feet dry all day. Molded Timberland PRO rubber toe protectors around the toe caps increase abrasion-resistance and durability. To avoid injuries from the toughest compression and impaction that your feet may encounter the composite safety toe boots provide superior protection without the weight of a steel toe and the fiberglass shank provides structural support.